Helping Seniors of Brevard Inc. is a Brevard Based 501(c)(3) Non-Profit Organization. Helping Seniors of Brevard Inc. is all about providing a good source of information that will help Seniors and those who care for them. Our intent is to always provide good, timely, factual and important information so that all who visit this website will be better informed. Helping Seniors of Brevard produces Television Programs, Radio Programs and Newspaper and Magazine columns that provide good information on a wide variety of topic of interest to Seniors. We have collected that information into a useful format that you can use to search for particular topics of interest to you. You can use the “SEARCH” tool at the right to help locate topics by interest. You can CONTACT US at 321-473-7770 or email us at Info@HelpingSeniorsofBrevard.org. We are here to serve you. 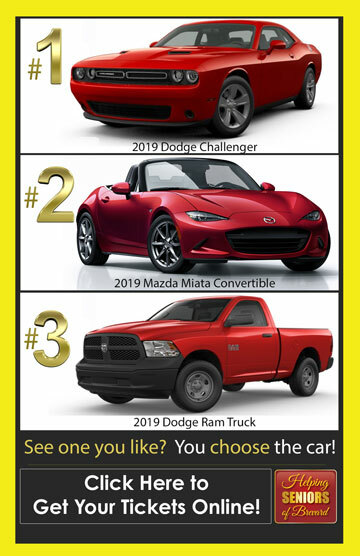 Helping Seniors Of Brevard Inc asks people who donate to the “Win the Classic” fund-raiser car raffle to provide a minimal set of personal information. We collect some personally identifiable information such as your name, address, phone number, email, etc. We also collect some information automatically such as cookies. Cookies are used to significantly enhance your experience as a user and customer of Helping Seniors Of Brevard Inc. Cookies make it possible to keep track of your purchases, deliver content specific to your interests, save your password, and track other information. This means you do not have to enter information multiple times. You may disable cookies on your web browser if you choose, although you will have limited functionality on this site and this may affect your enjoyment of the website. Like most websites, we also collect IP addresses to help us understand who is using our website and how it is being used. This allows us to improve the sites functionality and better service you as a customer. 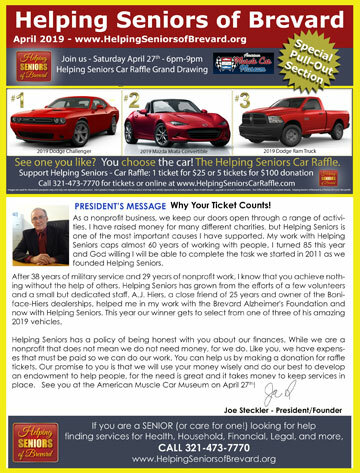 Be aware when you purchase a raffle ticket on our site, we will share your personally identifiable information with the raffle manager at Helping Seniors Of Brevard Inc. This is important for several reasons. First, raffle dates, times, locations, and other information may change. In these cases, the raffle manager will need to communicate with you and other ticket buyers. Given these reasons, it is critical the raffle manager has your information; thus, there will be no opportunity to opt-out. Raffle managers may use your information in accordance with our privacy policies. Please understand their privacy terms before purchasing tickets as they may contact you using your personal information or share your information with others. You are responsible to contact these parties prior to purchase to instruct them on your personal privacy wishes. When posting a new raffle, you will have the option to publish and un-publish your raffle. If you select to publish as a public raffle, we cannot control who will view the information you have posted. This information can be collected and viewed by anyone so we encourage you to use discretion when posting personal information. © Copyright 2017 Helping Seniors Of Brevard Inc. All rights reserved.